Sharkoon presents the X-Tatic S7, a new 7.1 surround sound headset with Dolby Pro Logic IIx support. It has a MSRP of 119EUR. Sharkoon presents the successor to their Dolby console headset X-Tatic SR. With the Sharkoon X-Tatic S7, Sharkoon has thankfully updated the sound format by providing two additional sound channels for authentic and room-filling 7.1 surround sound. The headset supports the new "Dolby ProLogic" version IIx, which combined with "Dolby Headphone" technology generates authentic and room-filling 7.1 Sound for stereo headsets from analog stereo signals and digital 5.1 Dolby Digital signals. In addition, Sharkoon has replaced the previous USB2.0 cable for an included USB2.0 Y-cable, providing a stable energy supply to the headset via a second USB port for current or weaker sound sources. The Sharkoon X-Tatic S7 also includes its predecessor's proven features. With its versatile Sound Control Unit and extensive cable set, the headset is designed for use on the Xbox 360 and PlayStation 3, and supports the voice chat feature on both consoles. 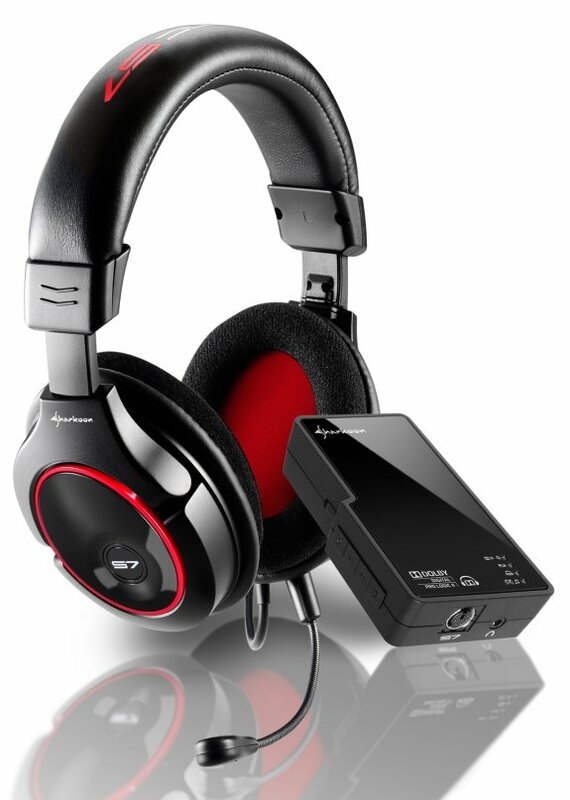 But in addition to PCs, Notebooks and - in the absence of a USB interface with optional USB power adapter - DVD players, tablet PCs, smartphones and MP3/MPV players it also includes high-quality 40 mm neodymium speakers, a cable integrated amplifier and Dolby Headphone audio experience with a diverse sound options. The flexible, detachable microphone, the cushioned, rotating and pivoting ear cups, the adjustable headband and the more than four meter long cable ensure a flexible operation and a high-level of wearing comfort. On top of everything else, the color scheme of black with red applications gives the Sharkoon X-Tatic S7 an exciting look. End customers will find the Sharkoon X-Tatic S7 available for the suggested retail price of 119.90 euros from authorized retailers.